The Horizon; what is it? What is the Horizon? Introduction When writing the 200 reasons blogpost, one of the things I noted and remarked upon is that flat earthers do not seem to know what the Horizon actually is. This post is dedicated to provide that information. This also means it is slightly mathematical, although it does not require much beyond high school level math. The Horizon: Where is it? So this is the first derivation. The concept is pretty simple, although somehow it has not been made clear to a large number of people. Draw a circle. Now, pick a point - any point outside the circle will do. Now, grab a ruler and make lots of lines. What do you find? There are, in essence, three types of lines. First, there are lines that aren't coming near the circle. 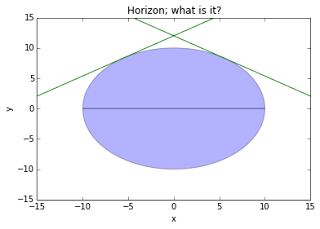 Second, there are lines that intersect the circle - passing through it twice. And there are those very special lines that only intersect once. You'll also find that, from any given point, there are only two of these very special lines.